Crunchy healthy oatmeal raisin cookies that are dairy free, gluten free, and so simple to make! The other day I had asked everyone what type of cookie I should make next. It was right after I shared my healthy version of those rainbow M&M cookies - which by the way are so easy to make, less than 5 ingredients, and taste delicious! The majority of you all mentioned that you would love a healthy oatmeal raisin cookie! I was about this because since being pregnant all I have wanted to eat was oatmeal! When I was younger I loved the oatmeal cookies with the icing on top and they were one of my favorite desserts to eat, even if they did come from a package! Today, I am sharing with you healthy oatmeal raisin cookies. They are 100% dairy free as usual, but also gluten free and low in sugar! After baking them in the oven they were crispy around the edges, the bottoms were slightly brown, but soft in the middle. They require one bowl and about 10 minutes in the oven! I have not tested the recipe with a flax/chia egg and currently do not know of any subs for the almond flour. I will say that I did test them out previously with gluten free flour and it did NOT work. They looked super delicious, but the taste was off- totally dry and really just bad…. I do believe that I had the ratio of gluten free flour to liquid off and used way too much of the flour. I would suggest that if you were using AP flour or GF flour, you may need to add in another egg, more oil/butter, or double the sugar content. The recipe will make about 9 cookies and they will last in the fridge for up to a week or freezer for longer! You can always reheat them in the oven for a softer cookie or eat them right out of the container. If you are looking for other subs, the coconut sugar can be subbed for any sugar except liquid. You can sub the non-dairy butter for oil or coconut oil (but may change the test), and feel free to add in chocolate chips or any seeds of your choice! 1/2 cup raisins or more! To the same bowl, add the egg, vanilla, coconut sugar, and melted butter (or oil of choice). Mix. Add in the raisins and gently stir with a spoon. Add in any extras here, chocolate chips, seeds, etc. Scoop into a spoonful amount- enough to give you at least 9. Bake at 400 degrees for about 10 minutes. I would check after 8. The bottoms should start to brown and the top/edges will be crispy! Allow to cool completely before storing! A gooey doughy like chocolate chip cookie for ONE that is completely dairy free and gluten free! Takes less than 20 minutes from start to finish! You know when you just want one (maybe two) chocolate chip cookie but do not want to go through all the trouble of making an entire batch. Well, this recipe is just for you. This recipe will give you a warm, giant chocolate chip cookie that is crispy on the edges and soft/doughy in the middle. SO. GOOD. It is so easy to put together and takes about 15-18 minutes in the oven. I do always love making a batch of chocolate chip cookies, but I am usually the only one that will eat them in my apartment and hate throwing them away once they have become stale. I will try to give them away or freeze them for later on, but sometimes its just not the same as a freshly baked one! To give you an idea of the size it is probably the size of your palm and dense! You can flatten it out using the back of a spatula (I did not for this photo here) which will give you a bigger and flatter cookie. In the photo above I rolled it into a ball, slightly flattened it and then baked it. This gave me a dense, dough like cookie! So really it just depends on your preference! This recipe is completely dairy free and gluten free! I did not try any other subs for flours or a chia egg. So I am not entire sure if it will work. If you try it out, let me know! In a small bowl combine and mix together the melted butter and coconut sugar. Add the vanilla and the warm water, mix. Add the GF flour, baking soda, sea salt, and mix. Add in your chocolate chips or any additional add ins. Gently fold together. Roll into a ball and place on the baking sheet. Flatten slightly. Bake at 350 degrees for about 16 or so minutes. It will depend on how thick the cookie is. Allow to cool slightly and eat! These chocolate chip cookie “muffin” treats are one of my favorite and EASIEST desserts to create. They technically aren’t a muffin - but I used a muffin tin to bake them in and look wise that is what they resemble. Texture wise, they are a cross between a crunchy chocolate chip cookie and slightly soft and cake like in the middle- almost like a scone and filled with chocolate chips. It is like a hybrid between a cookie, muffin, scone and a chocolate chip blondie, but whatever you want to call them, you have to make them! You’ll need gluten free flour, (regular flour works too! ), an egg, coconut sugar, dairy free butter, chocolate chips, and just a few others to make these. Also, you can add in anything else you would like, raisins, oatmeal, or chopped nuts. After they cooled off after baking in them in the oven, I froze them so I could keep them for longer, but to be honest, I ended up preferring them that way because they tasted like frozen cookie dough! They are completely dairy free and gluten free! They are low in sugar and make the perfect afternoon treat or post dinner snack. 1/2 cup (or more) dairy free chocolate chips. Additional add ins: handful of raisins, 4 tbsp. oatmeal, chopped nuts. In a bowl mix the melted butter, coconut sugar, egg, and vanilla until well combined. In a separate bowl, mix together the flour, baking soda, baking powder, sea salt. Combine the wet ingredients with the dry ingredients. Stir until combined. Add in the chocolate chips and any additional add ins, if using. Gently mix. Add about 1 heaping 1 tbsp. of the dough into the prepared muffin tin. Bake at 350 degrees for about 15 minutes. The tops and edges will brown and be slightly crispy. Allow to cool completely and remove from muffin tin. Both gluten free flour and all-purpose flour will work. I have not tried any other subs with the flour. I have not tried any subs with replacing the butter, such as coconut oil. You can however, replace with regular butter if not dairy free. The first time I made these I used 1/2 cup coconut sugar and they weren’t sweet tasting at all. If you prefer things on the sweeter side use 1 cup, but if you want somewhere in the middle I suggest using 3/4 cup. It will not change the texture at all. 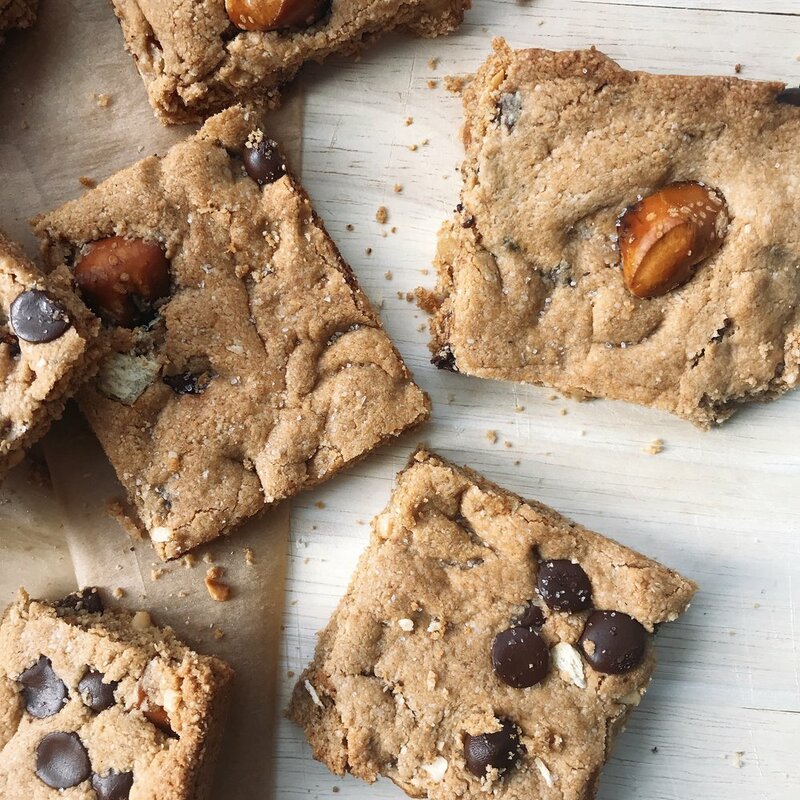 Chewy chocolate chip pretzel blondies that are completely dairy free, no eggs, and gluten free! They are lightly sweetened with coconut sugar and have the texture of a slightly soft cookie with crispy edges. I thought about making these all morning long and wanted to them to be healthy, easy to make, and with just a few ingredients - I wanted to use whatever I had on hand for this recipe and I hope that the ingredients are what you keep in your kitchen pantry regularly! They are completely dairy free (always! ), gluten free (almond flour! ), and they contain no eggs! I sweetened them just a bit with coconut sugar (1/4 cup for the whole batter), and they came out so perfectly chewy, not dense, soft but with crispy edges. The only thing that came to my mind after taking a bite of these, was it had a similar taste as if I used brown sugar and butter- yet I didn’t! Coconut oil + coconut sugar instead. Even though I am not vegan, I made them completely without eggs, because I do feel that many of you on here do not eat them and sometimes it just feels easier to make a recipe this way instead of trying to make it with a chia or flax egg. I think they have just the right amount of sweetness especially after adding the chocolate chips and it goes perfectly with the sea salt sprinkled on top and the pretzels mixed in the dough! I am more of a salty person when it comes to anything, even desserts so adding the pretzels was just the right amount! Little chocolate, little amount of sweetness, and delicious! I did use almond flour for the recipe and did not test any other flours out. As a general rule if you are replacing the almond flour (or using coconut flour for ex.) you tend to need to adjust the liquids as well (more liquid.) So, you could use a 1:1 ratio of almond flour and whole wheat or AP flour but the liquids may need to be adjusted. If you try it out, let me know! There is peanut butter in the mixture! (1/4 cup) but that can be easily replaced with any nut butter or even sunflower seed butter! Adjust the coconut sugar to your taste preference. Since no eggs were used you can actually test the dough before you bake and then decide if you need more! Pretzels are optional but give them an extra crunch and flavor- I chopped up sourdough pretzels into little chunks. (The brand I used was the Whole Foods brand!) Any will do! Preheat oven to 350 degrees and line a brownie pan (8x8) with parchment paper. In a separate bowl; combine coconut sugar, peanut butter, coconut oil, vanilla, nut milk. Mix until well incorporated. Combine the wet ingredients into the dry ingredients and mix until fully combined. Gently stir in the chopped pretzels and the chocolate chips. Bake at 350 degrees for about 20-25 minutes. I checked after 20 minutes and left them in for another 2 minutes. Allow to completely cool (about 10 minutes). Cut into squares! You can store them on your counter top in a container for about a week or in the fridge! Freeze for longer. Flourless fudge brownies that are super chocolate-y tasting, moist, easy to make! Yesterday, if you watched my stories on IG, I attempted to make flourless fudge like brownies….and it half failed. The taste was almost there, but they were completely flat and crumbled the minute you cut into them. When I took a peak at them in the morning they were hard as rocks! I wasn’t going to make them again because I do hate wasting ingredients, but I knew that if I just changed a few things around- I believed it would work. I wanted to make these brownies with as little ingredients as I could and with ones that you most likely already have on hand…this time around they were moist, rich in chocolate taste, dense, and fudge-y in the middle. SO GOOD! They only take about 15 minutes to bake in the oven and once they are completely cooled, you can dig in. I suggest allowing them to cool for at least 10 minutes or so, because when they are hot out of the oven they tend to crumble when you slice them right away. I did use almond butter in the recipe, but feel free to use peanut butter or even sunflower seed butter if you want to keep them 100% nut free! They aren’t super sweet; I only added about 1/2 cup of coconut sugar, so you can either add in about 1/4 cup more or add in about 1/2 cup of chocolate chips! That will make them a bit more gooey too. Once they were out of the oven, I drizzled a little peanut butter on top, but of course that is optional - you can leave them plain, or coat them slightly with coconut butter or melted chocolate. These brownies will last up to 5 days in the fridge or freeze them for longer! Combine the WET ingredients in a bowl, mix. I used my blender here to mix since my nut butter wasn’t as creamy. Add the wet ingredients to the dry ingredients. Mix until well incorporated. It will be somewhat thick. Add in your optional add ins here, mix. Spread evenly in your pan. Bake at 350 degrees for about 15 minutes. After 15 minutes stick a knife in the center and if it comes out clean they are done! If you over cook, they will be more cake like! Allow them to completely cool before cutting!! Store in fridge for up to 5 days or freezer for longer! These no bake gingerbread squares with a pecan crust are perfect for an easy holiday dessert! They are completely dairy free, raw, and filled with collagen for extra nutritional benefits and protein! No bake desserts are my favorite ones to make because they are pretty simple and you can always adjust the ingredients and the taste to your preference along the way. With the holidays coming up, I wanted to share these raw gingerbread squares with a pecan crust! They are the perfect balance between sweet, nutty, and full of flavors that remind me of Christmas; ginger, nutmeg, molasses, and cinnamon! I was originally planning on making gingerbread cookies but thought these were a bit more fun, easy to prepare if you are short on time, and the perfect size to bring to any holiday party. Not only are these squares simple to make, but they are good for you; filled with nuts for healthy fats, molasses- which is loaded with iron, selenium, and magnesium, and some of the best anti-inflammatory spices- ginger, nutmeg, and cinnamon. I also added in Vital Proteins Marine Collagen for gut health as well as additional protein. I love sneaking in the Marine Collagen into just about anything; hot chocolate, my morning coffee, smoothies, protein pancakes, and even into homemade sauces! The Marine Collagen is completely tasteless and mixes easily into anything; raw, baked goods, smoothies, or puddings! I feel that the collagen has tremendously improved my gut health and I always make sure I have it everyday and especially when I am traveling! They have on the go packets which makes it more convenient to travel or even bring to a restaurant or your favorite smoothie bar! Despite having two layers, these bars are easier to make than you think! Plus, the two different layers gives them something a little extra and makes them a little different than simply rolling into balls. For the base, I mixed together pecans, molasses, ginger, cacao powder, dates, and collagen. The top layer is made with oats, cashews, molasses, maple syrup, spices, and coconut oil. They are so crunchy, chocolate-y, slightly sweet and salty! I think that they beat any store bought gingerbread cookie especially since you can feel good about eating these! For the ginger flavor, I used candied ginger that I had found at the grocery store, but you can just use either real ginger or in the powdered form! You may need to adjust slightly to your taste preference! As far as subs, any nuts will work, but I do believe that pecans are the best in terms of taste for the base! Same with the maple syrup, it works the best but honey can be used as another option! After I made these and cut them into squares, I kept them in the freezer so not only will they last longer but they hold their shape better as well! I also blended the nuts in the food processor only slightly to give each bite an extra crunch- but do what you like! Add the ingredients for the base layer into your food processor, starting with the pecans. Mix until it almost resembles flour consistency. Add the remaining ingredients and mix until well combined. In a square pan, spread evenly; so it is about 1 inch thick. Place in freezer and prepare the second layer. For the second layer, add the oats and the cashews into your food processor and blend until flour consistency. Add the remaining ingredients and pulse together until well combined! Taste test and adjust. Spread the second layer over the first and sprinkle with molasses and ginger. Place back in the freezer for about 5 minutes. Cut into squares! Store in an airtight container for up to 1 week in the fridge or longer in the freezer! Chewy and fluffy chocolate chip pumpkin blondies! Perfect for the fall, healthy treat or snack. They are dairy free and gluten free! I made these on a whim the other day because I was craving the pumpkin mix from Simple Mills, but I didn’t have it on hand…if you have ever tried that- you’ll love these! They are really light, not a dense blondie, fluffy and filled with dark chocolate chips and walnuts for some crunch. I think they make the perfect healthy treat or afternoon snack; but the ingredients are so good that you can eat them for breakfast with your morning coffee. I don’t know why but I almost prefer these verses a regular chocolate chip blondie, they are a little less sweet and not as dense; which I prefer! This year so far, I already have so many pumpkin recipes on my blog; Pumpkin Turkey Chili, Pumpkin Oat Cookies, Pumpkin Spice Oat Bars, and a few more things that I am going to share a bit later in the season. Ironically last year, I didn’t make one thing with pumpkin; I wasn’t a huge fan until this year…I think it is pretty easy to add pumpkin in to almost everything without it being so overpowering; plus it is really good for you! Also, the pumpkin and pumpkin spice makes your kitchen smell amaaaazing. For this recipe you need one bowl and about 20 minutes of your time! You only need 1/2 cup of the canned pumpkin puree, but you can save the leftovers and use them for the recipes above, add into your morning oats, smoothies, or even coffee to make your own pumpkin spice latte! I also used almond flour for this recipe, but I have not tried any others. I think your safest bet would be to use whole wheat flour if you need a replacement! The pumpkin blondies will last about a week in the fridge, but you can always freeze them to last longer. To warm them up (if you want to) just place them in the under at 400 degrees until the chocolate begins to melt! 1/4 cup dairy free chocolate chips + more to spread on top. *If you do not have a pre-mixed pumpkin spice, make a blend of ginger, cinnamon, nutmeg. Preheat oven to 400 degrees. Line an 8x8 pan with parchment paper. Set aside. In a large bowl, mix all of the wet ingredients (including the egg) with a spoon/spatula. Add the DRY ingredients and mix until well incorporated. Fold in the chopped nuts and the chocolate chips. Pour into prepared pan and spread evenly. Top with more chocolate chips. Bake in the oven at 400 degrees for about 15- 20 minutes. Check after 15 minutes. If you stick a knife in the middle and it comes out clean, they are done! Store in an airtight container for up to a week in the fridge or freeze for longer! I am typing this up as it is raining like crazy, storms, and flooding - the humidity level is so high today and it triggers my migraines. I took a poll on my stories this afternoon and couldn’t believe how many of you out there suffer from migraines as well AND digestive issues. I somewhat guessed that most people have some type of digestive discomfort but was surprised as to the percentage for, vs not. Many of you don’t know your triggers and are trying to navigate that, but are also afraid to see your doctor. I took the polls because I was mainly curious and I have an idea for a blog post that I want to work on that can help you face your doctors and your symptoms. I have suffered on and off from migraines since graduating from college about 10 years ago. Sometimes I have 15 or more a month or none; sometimes I have to go to the ER for treatment and other times I can manage the pain on my own with a few tricks. Either way it is totally debilitating and often times I can not work through them; causing me to be down for the count for a few days or an entire week. As far as digestive issues, you can search about my journey in my many blog posts. anyways, I needed to take it a little easy today in order to prevent a full on migraine attack. So, I made this frozen yogurt treat or snack in about 5 minutes, popped it in the freezer to settle (freeze) for about 2 hours and it came out so good. You have to treat it like ice cream when you eat it because it will melt fast. Sometimes something cool helps my body cool down as it runs super hot when I have a migraine. I used blueberries, nut butter, walnuts, and a little berry flavored protein powder for the mix in, but you can use anything you want! I also used dairy free greek style yogurt (plain, unsweetened), but I am sure non greek style will work- just haven’t tried it! it is really simple to put together and is good for a cooling snack or dessert! The amount that it yields, depends on how much yogurt you use & how you slice it! toppings; chopped nuts/seeds, chia seeds, chocolate chips, fruit, nut butter, cacao nibs, chopped dates etc. Line a cooking sheet or a small baking pan with parchment paper. Once settled cut into pieces. Store in the freezer in an airtight container! Flavor options: You can add anything in or on top! Mix in 2 tbsp. pumpkin puree, 1 tbsp. pumpkin spice mix, dash of cinnamon, 1 tbsp maple syrup. Top with chopped nuts/seeds. a hearty 'beauty' cookie made with just a few ingredients, no added sugar, packed with collagen, fiber, and protein and they are so good for you! This morning I made cacao nib collagen beauty cookies and I am obsessed! These cookies require a few 'good-for-you' ingredients, one bowl and about 20 minutes in the oven! They are a bit crumbly with crispy edges, and a soft center. They almost remind me of shortbread cookies in terms of their texture and taste, but with added cacao nibs. I call these cookies beauty cookies, because I added in chia seeds (high in fiber & omega 3s = for healthy digestion and healthy fats for skin), cacao nibs instead of chocolate chips for antioxidants, coconut oil for healthy fats, chopped walnuts for omega 3s and they are great for skin, and last but not least; Vital Proteins Marine Collagen! I think by now I have over 20 or so recipes that include Vital Proteins Marine Collagen or smoothies using their beauty waters, so you can say that I am a little obsessed with adding it into anything that I can! Just search "Vital Proteins" on my blog and you'll see all the different ones (banana breads, no bake energy bites, golden mylk smoothie, cauliflower bites, cacao brownies, butternut squash mac and cheese & more!) Plus, it is really simple to add the collagen into just about anything, you can't taste it at all and it adds some extra protein too! I love the collagen for both gut health (to help improve digestion, especially when I was suffering from leaky gut and SIBO!) and skin health! I always feel that my skin has that natural glow the more that I use collagen in my diet and makes my hair grow like crazy! Back to these cookies, all you need to do is mix all the ingredients in one bowl, scoop out a spoonful of them onto your baking sheet and bake. Once they are done you can sprinkle them with chocolate tahini and bee pollen or anything you'd like! Note that, I didn't add in any sweetener to the cookies, but maple syrup or honey would be the perfect choice if you prefer things on the sweeter side. You can also use dairy free chocolate chips if you prefer over cacao nibs, but I was simply trying to keep these cookies as low in sugar as I could! toppings: chocolate tahini (or any nut butter/seed butter of choice), bee pollen, chia seeds. 1. Preheat your oven to 350 degrees and line a baking sheet with parchment paper. Set aside. 2. In a large mixing bowl add all of the above ingredients. Mix until well combined. 3. Scoop a spoonful out, add to the baking sheet, and bake at 350 degrees for about 20 minutes. The bottoms will be slightly golden brown, crispy edges, and soft center. 4. Store in the fridge for up to a week. 1. You can sub any nut/seed butter of preference. If you are looking for that chocolate chip cookie taste, cashew butter would be the best sub. 2. Please feel free to add in any liquid sweetener of choice. 3. I have not tested any other flours, however if you are using coconut flour you may need to increase your liquids slightly as coconut flour tends to need more/dries out recipes. Start by adding in another tbsp. of coconut oil or even water! 4. The collagen is completely optional, but adds in so many benefits! If you are not adding it in the recipe, you do not need to change any of the other measurements. I am going to keep this post short - Homemade Classic Chocolate Chip Cookies! Hands down my favorite dessert of all times and these remind me so much of the ones that my mom made for my brother and I all the time. Depending on the size of the cookie that you make they are either super crispy with golden brown edges or they are the softest melt in your mouth gooey kind. This time around I made extra large ones, baked them for a bit longer than usual; they came out super flat, in a good way - crispy, crunchy, and golden brown edges and bottom! Normally, I make them on the smaller size (yields about 48 cookies) and when they are smaller and baked shorter, they are so soft in the middle; it basically feels like you are eating melted chocolate. I add in a hefty serving of dark chocolate chips in the mix to ensure that each bite has a few and when they are fresh out of the oven I sprinkle pink sea salt on top. Perfect sweet and salty combo. These cookies are dairy free since I can't have butter, but I did use dark brown sugar and all purpose flour because it just makes the cookie, THE cookie. I haven't tried subs for any of the ingredients because I have always made them this way for over 10 years! This is actually the first time that I am sharing the recipe, with anyone!! See the notes before baking and you won't mess these up! Enjoy! *Make sure the butter is soft- leave it out for an hour or longer the better- I tried melted it over the stove in a pan and the cookies came out so greasy and flat! If the butter isn't soften, the cookies will be a little more dense / very soft baked in texture. Crunchy dark chocolate cookies sprinkled with sea salt! 1. Preheat the oven to 360 degrees. Line a baking sheet with parchment paper. Set Aside. 2. Cream together the butter, coconut sugar, and brown sugar until well mixed. I use an electronic hand mixer, but a blender will work! 3. Add the eggs and the vanilla and mix for another 2 minutes. 4. Slowly add the flour, baking soda, baking powder, and sea salt. Mix until well incorporated. 5. Fold in the chocolate chips by hand. 6. Using a spoon, scoop a heaping spoonful onto the baking sheet. 8. Sprinkle sea salt immediately once they are hot out of the oven. 1. If you make the cookies on the smaller size, you should yield 48. Bake for roughly 12 minutes or until the edges are golden brown and the soft is "gooey"
2. If the cookies are large, you will end up with 24. Bake for roughly 16 or so minutes. The cookies will be flatter, super crispy, golden edges and brown on the bottom. 3. I haven't tried any subs since this is how I always make them. BUT regular butter will work. 4. Store them in an airtight container either in the fridge or on the counter and will last for up to a week! 5. Make sure the butter is soft- leave it out for an hour or longer the better- I tried melted it over the stove in a pan and the cookies came out so greasy and flat! Less than 5 ingredients for these healthier rice krispies treats that are super sticky, crunchy, and a little sweet! These were one of my favorite things to eat as a kid, especially on the weekends during my swimming days. I always ate the ones from the package; so who knows what I was putting in my body when I would consume a few in a row - but I especially loved the homemade ones at our swim meets- they were extra large in size, I mean what isn't or wasn't supersize - super sticky from the marshmallows, and of course overly sweet. Honestly, probably what made me swim so fast for each race- fueled by sugar ha! I wanted to re-create these, using a bit less sugar or a healthier alternative, no marshmallow nor butter, and of course adding in some extra nutrients, like Vital Proteins Marine Collagen. If you search my blog you can see that most of my recipes; especially my snack recipes, contain collagen! It has been extremely beneficial with improving gut health; (I used to suffer from leaky gut, SIBO, and IBS), making my hair grow fast, strong, and shiny, as well as improving my skin! I try to add Vital Proteins Marine Collagen into my routine almost every single day, by either adding in a few scoops to my smoothies, coffee, and hiding it in all of my energy bites. I also love their beauty water flavors for my morning water with lemon; it adds flavor and mixes well. The best thing is that you can't taste the Marine Collagen yet it adds all these benefits for your overall health and extra protein! For these rice krispies treats you only need a few ingredients; I used peanut butter (but any nut butter or seed butter will work), a sweetener of choice, the collagen, and of course a rice cereal! After melting everything together, stirring in the cereal and the collagen, all you have to do is wait about 30 minutes for everything to settle! They taste like the real deal! They came out super crunchy, sticky, and both a little salty plus sweet! I topped mine with cacao nibs and melted a little coconut butter on top, but it is completely optional! Total time: less than 40 minutes! 1. In a medium sized sauce pan stir together coconut oil, nut / seed butter of choice, vanilla, cinnamon, and sea salt until well combined. 2. Once the mix is smooth, take the sauce pan off the heat and add in the rice cereal as well as the collagen. 3. Stir until well incorporated. 4. Pour in a lined (lightly coated with coconut oil or spray) 9x9 pan and spread evenly. Allow to settle in the fridge for up to 30 minutes. Cut into slices and store in an airtight container for up to a week. I topped mine with cacao nibs! I also love melting coconut butter and drizzling that on top! 1. You can use any sweetener of choice. Honey would work second best, because it is a little more stickier than maple syrup. I haven't tried date paste or an alternative, but it will change the taste a bit and the texture. If you aren't using brown rice syrup, keep the treats in the fridge for a bit longer to harden! 2. Any nut or seed butter will work. I used crunchy peanut butter. 4. The Vital Proteins Marine Collagen is completely optional, but it adds so many nutritional benefits! You won't taste a thing! I've always loved see raw "cheesecake" bites floating around and have been wanting to make my own but was slightly intimidated by the process- not realizing just how simple they are to make! With Spring around the corner as well as Easter, I thought these little bites would be perfect for a dairy free/gluten free friendly dessert! The middle and top layer of the bars are so creamy, light, and refreshing and the base is a touch sweet with hints of chocolate! They do not take long to make either, you just need to make sure you set some time aside (overnight) to soak the cashews- which gives the layers a creamy smooth texture. Cashews are pretty amazing with what you can do to them after soaking them overnight. I made the base of the dessert chocolate in flavor, but you can leave out the cacao powder and really add in anything you would like! The second time I made these squares, I added in peanut butter to the cheesecake filling mixture, left out the blueberries and they came out so good! For the chocolate vanilla blueberry cheesecake squares, I also added in Vital Proteins Marine Collagen for some extra health benefits. Adding in the Marine Collagen doesn't change the flavor of the bites, but gives you extra protein, supports your gut/joints, and helps you with brightening your complexion (which I have noticed with their beauty waters!) and making you hair/nails so strong/long! I currently have over 16 recipes on my blog using Vital Proteins, so you can definitely say that it is a big part of my diet and overall health routine. Not only is it easy to incorporate the collagen into your smoothies, coffee, or desserts, but I love adding it into savory dishes too like my butternut squash mac and cheese, quinoa lentil bites, or even this healthy sweet potato salad! It has tremendously helped improve my gut health (less bloating, better digestion, and helped with the improvement of my IBS and leaky gut!). I can't go a day without it! These little squares are so rich in tasting, salty, and a tad sweet but won't bog you down as maybe a regular cheesecake would! Making these raw, dairy free, and with less sugar than normal make the perfect alternative and you can really cater them to your taste preference as long as you have the measurements down! Freeze time: 3-4 hours or overnight! 2. In a food processor blend together the base of the dessert until a dough like consistency is formed. Once finished, press into pan or muffin tins. If using individual sized cups, fill each with about 2 tbsp of the base layer. Place in freezer while mixing the the layers. 3. In your blender/vitamix; mix together until creamy all the layer ingredients except the fruit. 4. Once blended until completely smooth, layer about 2 tbsp. over the crust. Place back in the freezer. 5. Next, with the remaining cashew mix; add in the blueberries or any fruit you are using OR any add ins. Blend until smooth. 6. Layer the remaining on top of the plain "cheesecake" mixture. 7. Place back in the freezer to set for a few hours or overnight before cutting. 1. For the base layer, you can use any mixture of nuts or seeds. You just need about 1 cup total. 2. Feel free to leave the cacao power out and keep them plain. 3. You can sub blueberries for any fruit. 5. If you need to sweeten up the cashew layer; start by adding 3 tbsp of sweetener of choice, such as maple syrup or honey. I would stick to a liquid sweetener so it blends easier. 6. Store in the freezer so they keep their shape. OKAY. These are like a miracle- a healthy chocolate cookie cloud type of miracle. Soft gooey middle and a little crunchy on the outside. They kind of remind me a brownie, but in a cookie form, with crispy edges all around. Secret ingredient? Avocado. Sounds crazy, but I first started to love the chocolate avocado combo when I made my chocolate avocado pudding; it makes it really rich, smooth, and creamy without tasting ANYTHING like avocado - and this is exactly how these cookies came out. I also love adding in avocados to my chocolate smoothies for some extra healthy fats, fiber, and it just makes the smoothie super thick and creamy. Plus, avocados are just good for you, so you can reap all the benefits while eating these cookies! I also used less than 8 ingredients and they took less than 15 minutes to make. The avocado replaces the butter or an oil in the recipe and gives the cookie that richness taste, but the cacao powder, chocolate chips, and the other ingredients masks the avocado flavor. For the recipe I used about 1/2 cup of coconut sugar and I found them to be perfectly sweet with the addition of the chocolate chips which balanced out the bitterness of the cacao powder. Next time I make them, I would probably stick to the same measurements or even add a bit less coconut sugar! It really depends on how big of a sweet tooth you have! I also slightly under baked the cookies so the chocolate chips would be gooey even long after they were kept out of the oven and it made for a really soft center, but if you like a more firm cookie you might want to keep them in there a little longer than what I did. I also made my cookies pretty large and ended up coming out with 6. They do not spread in the oven and after they were finished baking I sprinkled the top with a little sea salt! Honestly these right now are my favorite cookies and don't be turned away by the avocado in the recipe! It is so good! 2. In your food processor or with a hand mixer; blend together the avocado, water, egg (or flax egg), vanilla, and coconut sugar until completely smooth. 3. In a separate bowl combine cacao powder, chocolate chips, cinnamon, and baking soda. 4. Add the wet mixture to the dry ingredients and stir with a spoon until incorporated. 5. With a spoon, scoop out a spoonful and use another spoon to help make a dollop on the cookie sheet. Then flatten each cookie slightly. They will not spread when baking. 6. Bake at 350 degrees for about 12 minutes. Sprinkle with sea salt when finished. Allow them to completely cool when finished then store in an airtight container in the fridge for up to a week. I stored mine in the freezer once they were cooled & they didn't become rock solid, they lasted longer and were still soft with each bite! 20 minutes from start to finish for these cookies and I am pretty sure you have everything you need for them in your kitchen right now....these are everything but the kitchen sink cookies; compost cookies; with hints of peanut butter, chocolate, coconut, a little nutty, a tad sweet and salty! They are super soft and chewy in the middle but crunchy on the outside; you're going to love them. Each bite is a little different since, I basically threw a few of my favorite things in the bowl to make up these cookies; low sugar paleo granola, creamy peanut butter, unsweetened shredded coconut flakes, cacao nibs, gluten free oats, dark chocolate chips, and just a few more ingredients. The best part is; for the extra add ins; you can do as you please- you can use your favorite nuts, chopped dates, seeds, hard candies- you get the idea! The Marine Collagen adds in protein (9 grams per serving) and personally it has helped my IBS symptoms, helped improve my leaky gut, helped with hair growth, brighten my skin complexion, and really keeps my gut more balanced allowing me to eat a more variety of foods because my digestive system has improved since taking! A simple thing to add into my diet that has changed my health for the long term! So, why not sneak a few scoops in my cookies; especially when you can't taste it! These cookies make the perfect treat since they are so quick to make, simple, and you can cater them to you needs; just make sure you keep the nut to chocolate ratio pretty even! 1. Preheat the oven to 350 degrees and line a baking sheet with parchment paper. Set aside. 2. In a large mixing bowl, add the peanut butter, egg, vanilla, and the coconut sugar. Mix until well combined; either by hand, electric mixer or your blender. 3. In a small bowl combine the almond flour, baking soda, sea salt, and the Vital Proteins Marine Collagen and then add to the large mixing bowl. Stir until fully incorporated. 4. Lastly, add in the remaining ingredients. Stir by hand. 5. Scoop into even sizes (about the size of a golf ball). Add to your baking sheet and bake for about 10 minutes. The cookies will be soft/tender in the middle and crunchy on the outside. When finished sprinkle with sea salt. 1. If you are allergic to nuts or do not want to use peanut butter, you can sub any nut butter or seed butter of choice. 2. Coconut flour or oat flour can replace the almond flour. 3. For the add-ins (cacao nibs, chocolate chips, oats, shredded coconut flakes, granola) feel free to use anything you would like but stick to the measurements above somewhat. For example, you can sub 1/4 cup of the granola for 1/4 cup chopped nuts or 3 tbsp. gluten free oats for 3 tbsp. goji berries or pumpkin/sunflower seeds. 4. I did not test a flax egg, but it should work since the nut butter holds the cookie together as well. 5. You can omit the collagen it only enhances the nutritional benefits of the cookies! Just completely omit the collagen and it doesn't need to be replaced with anything. 6. Store in an air tight container for up to a week in the fridge or in the freezer for longer! My mom made fudge every single Christmas for the holidays, and it was my weakness. No matter where the pan of fudge was, on the table, the fridge, or about to be wrapped as a present for someone else, I couldn't help just slice myself a square. BUT, that fudge was made with condensed milk and loads of sugar, which is probably why it was insanely addicting and now flash forward to today, I am allergic to dairy and intolerant to sugar. So this fudge is a little different, but still addicting and creamy. You can read more benefits here, on their website! I love adding the beet powder into my smoothies, energy bites (like these chocolate coconut beet bites), or using it homemade salad dressings or pestos. I also added Eating Evolved's Coconut Butter into the mix to give it a hint of coconut and make the fudge extra creamy. It's kind of hard to not eat this by the spoonful....Then topped off the fudge before letting it sit in the freezer to settle with their Midnight Coconut Cacao bar. I love this chocolate bar in particular because it contains no sugar and it is a little bitter, but has a rich dark chocolate taste. It goes perfectly with the fudge since it is already a little sweet from the dates! This fudge is super simple to make! You just need to add all of the ingredients to your food processor, mix well until combined and then pour into a lined pan. Allow it to set overnight or for a few hours until it is set. You will need to keep this in the freezer because it will melt quickly because of the coconut oil! I pre-cut mine after letting it settle the first time and then when I want to eat it or serve it I just take it out of the freezer for a few minutes! This is perfect for the holidays too! 1. Add the above ingredients to a food processor. Blend until well combined. It will be on the thicker side/dense. 2. Pour into a 8X8 pan, lined with parchment paper. 4. Let it sit in your freezer overnight or for at least 5 hours. 5. Optional add ins: cacao powder, cacao nibs, or walnuts! 1. Make sure you use fall fat coconut milk or it won't be as thick/creamy if you are using light. 2. Taste test after blending, add more spices (ginger, nutmeg, cinnamon) to your taste preference. 3. It will melt somewhat quickly, so keep in freezer and before serving or cutting let it sit out for 5-10 minutes. A quick healthy fudge like brownie alternative that is no bake, super dense, a little sweet with a surprising spicy kick at the end! With the holidays right around the corner, we are all looking for some recipes to make; whether they are healthy, indulgent, simple, dessert ones, main dishes or whatever they are; we always need something and usually last minute! That is how it goes for me at least and when that is the case, it then needs to be easy to make, only require a few ingredients, and obviously taste good! I feel that I am always "stuck" making the dessert recipes with my family because they probably know they are going to have some type of healthy spin on them yet still taste like the real deal...so I decided to make these super fudge-y / dense brownies that are a little sweet with a major spicy kick at the end....and you don't have to bake them! Which is ideal when there are what feels like 100 things going on in the kitchen during the holidays! ...of course I added in some collagen in the recipe and I used Vital Proteins Marine Collagen. I use this every single day whether it is in my smoothies, energy bites, soups, coffees, salad dressings or waters. Just about anything you can think of, you can sneak this in there! I think if you search "collagen" on my blog over 7 or so recipes will pop up using this! Like this, Golden Mylk smoothie, or this sweet potato salad, and even this dark chocolate avocado pudding! I use it to strengthen my digestive system, my nails, hair and feel that it was truly helped in repairing / improving my leaky gut and my severe digestive issues! The great thing, is that it is tasteless, so it will not change a thing in the recipe or in any recipe that you use it in! Back to these brownies. They are so chocolatey. Sweet. Fudge-y and perfect for the holidays or just when you need something! They almost remind me of a Mexican Hot Chocolate, but in a raw brownie form! They are easy too. You need any type of nuts as the base; I prefer almonds/walnuts, cacao powder, cinnamon, almond butter, dates, cayenne pepper, cinnamon, vanilla, nutmeg, cacao nibs and the collagen! I am sure that you have most of these ingredients on hand! Then you blend it all up, roll it out and done! Raw brownies, done in less than 10 minutes. 1. In your food processor blend together the walnuts and the almonds until finely ground. I left mine a little chunky. 3. Add in the dates, vanilla, and the almond butter and blend together until fully combined and a dough is formed. 4. In a square pan (brownie pan or a bread baking loaf) that is lined with parchment paper, add the mix and press firmly until the dough is even. Sprinkle with cacao nibs or toppings of choice. 5. Cut into squares OR place in freezer to harder for a few minutes to make it slightly easier. Store in an air tight container in freezer for longer or in fridge for up to 2 weeks. The collagen is optional, but you will get added benefits from using it! Adjust the measurement of cayenne pepper to your liking! You won't taste it right away, but it will be more of an after taste, so start small! You can sub almond butter or sunflower seed butter or completely leave this out all together and use about 1 cup of dates to hold everything together. To make them completely nut free, sub the nuts with seeds!